Re: Is your message getting lost in translation? It really is a small world. And the Internet has made it even smaller. At no time in history have we been more able to connect with customers, clients, friends and colleagues from all over the globe in the way we can today. Email is nearly instant. Skype and Facetime and other technologies let us chat in real time to people half way around the world. We can even do business with people almost anywhere, thanks to systems such as PayPal. But even though we can connect with any one of more than 7 billion people on this planet, we can't always form a meaningful connection. With visitors from all over the globe viewing your site, how can you hope to form a connection? Speak directly to one, you run the risk of offending--or at least confusing--another. And that's just the words you use. What about time zones for webinars? What about holiday greetings and news updates and even translations of files? None of these things are easily handled on a single website. Sure, there are translators available. Google has one of the best, but anything that happens automatically is going to be less-than ideal. And translators can't help with price conversions or time zones or meeting locations. Of course, there are other options as well. Some business owners choose to create different sites to target specific countries. Amazon.com becomes Amazon.ca or Amazon.co.uk. But for a one-person business or blogger, this kind of workaround is prohibitively expensive in both real costs--hosting, domain registration, and maintenance--but also in time and energy. After all, it's difficult enough to keep up with one site. Adding several others just to appeal to location-specific readers will no doubt cause a lot of undue frustration. But what if you could quickly and easily connect with readers in other countries, with a simple plugin? What would that do for engagement and conversations? Set your "default" country & cookie duration--to save on your server load time by not continually checking for a reader's location. Create unlimited text snippets that show only for those in the country you choose. Create country-specific text on pages, posts and landing pages--perfect for blogs, sales pages and opt-in offers, too! Target your ideal reader with country-specific pricing, events, coupon codes and more--all with a simple click. Reach more than 200 countries with specific messages, without having to memorize IP address ranges or perform complex redirects based on visitor location. Greet your reader in her native language--talk about making a great first impression! Connect with your audience in a way no automatic translator can ever achieve. Easy to install--just upload right from your WordPress dashboard. Simple to configure--no complex coding to struggle with or long IP addresses to research. Quick to use--one click, choose your country, enter your text. You'll be done in seconds! Low overhead--cookied visitors won't drain your resources like some other methods can. Stop struggling to create meaningful relationships with those in other countries--or worse, risk alienating them completely by simply ignoring their needs. Instead, use this powerful, easy plugin to present the right message to the right person at the right time--and win fans forever! P.S. As the world shrinks, it's becoming increasingly important to connect with an international audience. This plugin is the key to creating real relationships with readers from all over the world. P.P.S. 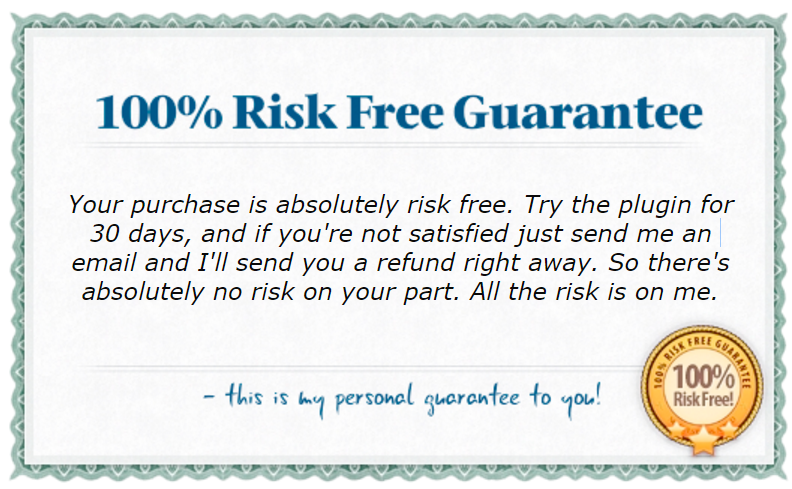 There's absolutely no risk to you--if you find this plugin does not make it easier to relate to your international readers, simply return it for a full refund.